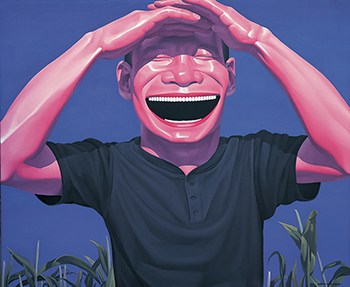 Yue Minjun’s first museum show in the U.S. will open at the Queens Museum of Art on October 14th, 2007. One of the leading figures in the Beijing-based movement of “Cynical Realism” that emerged following the 1989 student demonstrations in Tiananmen Square, Yue Minjun has since become a pioneering figure in Chinese contemporary art. Parlaying his iconic smiling self-portrait into his signature motif, he has gained an international following. Yue’s laughing faces are at once exuberant and indifferent. Placed against various recognizable backdrops, the tirelessly optimistic faces compel the viewer to question the larger social context portrayed in each painting. Yue Minjun and the Symbolic Smile will include bronze and polychrome sculptures, paintings and drawings and will be on view from October 14-January 6, 2008. – Activities for Classroom and Home Use. – An interview with Yue Minjun by Karen Smith. This exhibition is supported in part by Agnes Gund and Daniel Shapiro and Sotheby’s.